Electronic Parts and Service since 1952! Project of the Week Contest! What makes equipment Industrial Grade? remain our greatest pleasure. We thank you for the privilege of serving you. What's the difference? Which would serve you best? Consumer Grade is off-the-shelf equipment and is offered by both ourselves and other vendors. These are the apple-to-apple units to compare competitive pricing. These models are primarily meant for use in convenience stores, shopping malls, and other light duty applications. We do not, however, recommend them for rougher industrial use because of higher failure rates. They do, of course, have slightly lower initial costs. We won't publish them on the net for our competitors to see, but you, of course, can easily get a quotation by calling 800-227-1768. In making your final decision, between consumer and industrial grade, future downtime and maintenance costs should be considered. Industrial Grade units are the ones that last the longest and give the best performance. That's because after we receive them from the manufacturer, but before you get them, we put each unit through a special industrialization process which makes them highly shock and vibration resistant. This makes them better able to withstand the harsh environments of industrial applications. Converting light duty consumer units to INDUSTRIAL GRADE is exclusively offered by us. This assures you better performance, with less downtime, than any other equipment on the market. The symbol of toughness for Industrial Grade products. Watch for it. You'll own the best! You deal with the big picture. You make sure everything comes together as a whole. 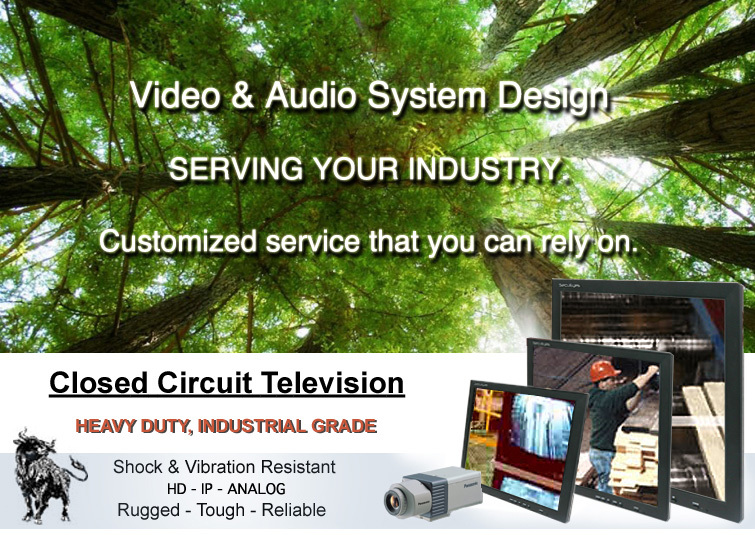 Closed circuit video is usually a small part of your overall operation, but it can contribute substantially to higher production, better safety, and more profits. CCTV can help control bottlenecks and pile ups on productions lines. Your operators can see up and downstream material flow and pace themselves more efficiently. Blind spots can be eliminated. Everything improves when personnel can communicate with our intercoms and see more with closed circuit video. Look over your operation with these helpful products in mind. Wouldn't you hate to miss a low cost opportunity to make your mill more profitable? Your job is critical to the success of your company and we know it can be challenging. You must establish a working relationship with many sources of supply. These sources should be able to deliver, be trustworthy, be fanatically committed to your best interest and their prices must be right. If you are one of the hundreds of industrial plants currently doing business with us you know these are the benefits you have from our relationship. If you are a new customer, looking for this type of association, check us out with your peers. See what they say. Then contact us. We think you, too, will like our friendly, professional service. You're the people who have to make it all work and then keep it going. Our exclusive industrial grade heavy duty units will make your job easier. You probably won't eliminate down time completely, but you'll minimize it, sometimes going for years without a problem. Closed circuit video and intercom systems also have their own requirements for you to be familiar with. Whether it be which camera to use, or what lens for your best field-of-view, what monitor, cable, or connectors, you can count on us for common sense solutions. In the areas of internet access, digital video recording, wireless transmission, etc., we are here for your technical support. Call us toll free at 800-227-1768. You will get friendly assistance. We want you to be successful with your installations.